This recipe is for my friend, Betty, the number one lover of creamy pasta dishes. Betty recently learned she has a number of food sensitivities. Eager to begin a new diet but a little baffled as to where to start, Betty called me up one day for some advice and recipes. With her top sensitivities being wheat, dairy, egg white, and nuts, Betty was a little worried that her mac and cheese days were over. Not so, Betty! Place the sunflower seeds in a bowl and submerge in water. Let soak for about 2 hours or up to overnight. Drain well. Bring a large pot of salted water to a boil. Cook your pasta according to package directions. Drain, return to the pot, and set aside while you make the sauce. Preheat a saucepan over medium heat and add the olive oil. Saute the carrots and onions with a pinch of salt for about 10 minutes. Add the garlic and saute for 30 seconds, then remove from the heat. Place the mixture in a blender or food processor. Add the broth, cornstarch, nutritional yeast, tomato paste, remaining 1/2 teaspoon salt, and sunflower seeds and blend until very smooth. Allow about 5 minutes, periodically checking sauce for smoothness. Transfer the sauce to the saucepan. Cook over medium heat, stirring often, until thickened. This should take about 15 minutes. Add the lemon juice. Pour most of the sauce over the pasta. Mix it up, and serve with extra sauce. Sprinkle pasta with paprika and dig in! I highly recommend you check out Chandra’s cookbook “Isa Does It – Amazingly Easy, Wildly, Delicious Vegan Recipes for Every Day of the Week” at your local bookstore. It’s well worth the purchase. (Now, it’s here where I had planned to list and show all of our favourite “Chandra” dishes. Too crazy because there’s just way too many! You seriously have to buy this book). This entry was posted in Meals, Side Dishes and tagged creamy pasta sauces, dairy-free mac and cheese, gluten-free, Isa Chandra Moskowitz, nutritional yeast, pasta dishes, sunflower mac, sunflower seeds, vegan, vegan mac and cheeze on November 7, 2014 by uberdish. I have been talking about this rich and creamy dish for so long that it’s about time I share the recipe. I love serving this delicious pasta dish to my dairy-loving guests. They all have been shocked with its better-than-the-real Alfredo taste! I apologize Alfredo di Lelio! The above photo shows our fettuccine Alfredo with steam fried crimini mushrooms, steamed broccoli florets and a garnish of chopped green onion. Along with a small bowl of Caesar salad, this is one of our 10 year-old’s favourite meals. She’s all into comfort foods and this one certainly hits the spot on a cold winter’s night. Over medium-high heat, steam fry chopped onion in a skillet with a bit of water. You may also try steam frying in a bit of vegetable stock or dry white wine. Steam frying works wonderfully with onions, garlic or any delicate vegetable and it’s a great way to avoid that extra fat. Add your garlic and let cook for a few more minutes. Remove from heat. Cook gluten-free fettuccine noodles according to package directions. Drain and return to pot. Using a Vitamix or other high-powered blender, combine onions and garlic, softened cashews, water, miso paste (if desired), lemon juice, salt and pepper. Process on high until the mixture is very smooth. This usually takes a couple of minutes. If sauce gets too thick, add a little water at a time and mix. Toss cooked pasta with Alfredo sauce. Serve immediately and garnish with parsley. Enjoy! Here’s another pasta favourite by Chloe to give a try! This entry was posted in Meals, Side Dishes and tagged cashews, dairy-free, fettuccine Alfredo, pasta sauce, recipes, vegan on February 25, 2014 by uberdish. We just returned home from another fabulous few days at the family cottage. The weather was beautiful, but a little on the cool side for swimming. At least it was for me. A good northerly wind certainly didn’t stop the kids. Do they ever get cold? It was a great weekend! My mother-in-law and father-in-law from Toronto joined us for some delicious gluten-free and vegan meals. I am absolutely thrilled that they enjoy my cooking and are so willing to try new dishes. This recipe received many compliments from the young to the old. So, I just have to share it! The uncooked kebobs were placed in a glass container with a lid. The lid allowed for a “shake and twirl” during the marinating process. The veggie kebobs were marinated in a delicious Teriyaki Sauce adapted from Lindsay Nixon’s cookbook Everyday Happy Herbivore. Like all of Nixon’s recipes, this sauce contains no added oil, which you tend to find in so many sauces and marinades. I went with a Teriyaki flavour because it was requested by “Kay”, my 14 year-old. A super choice, if I do say so myself! I left the kebobs to marinate in the fridge for a good portion of the day while we enjoyed the beauty of the lake. I really wish I had a photo of the finished product on a bed of brown rice. I just wasn’t thinking. We were three-quarters of the way through our meal when I realized that I had forgotten a plated photo. Unfortunately, this is typical for me. I’ll blame it on my impatient stomach. Whisk well all the above ingredients in a saucepan. Bring to a boil. Once at a boil, remove the saucepan from the heat and whisk for a couple more minutes. Let cool. Once cooled, pour marinade over container of uncooked veggie kebobs. You may want to reserve a little marinade in a bowl to be used during the grilling. Place container of kebobs and marinade in the refrigerator. Occasionally turn the kebobs to allow sauce to coat each and every vegetable. * I used coconut aminos to replace the soy sauce in this recipe. Many individuals have an intolerance to soy and my husband is one. Using coconut aminos allowed him to enjoy the Teriyaki flavour of our grilled vegetables without any digestive upsets. As for the kebobs, he removed the tofu and shared it with other family members. Please note that there is absolutely no need to go on a frantic search for a “meat alternative”, like tofu for these kebobs. A varied, whole foods, plant-based diet is perfectly healthy and contains all the protein your body needs. Tofu is certainly not necessary to make these kebobs a complete meal! Interested in learning more about tofu and soy? Check out my thoughts here. Here are a couple of beautiful photos my daughter took this weekend of the lake. 🙂 She so wanted a loon or osprey shot! Maybe next time. This entry was posted in Meals, Side Dishes and tagged food, ginger, gluten-free, kebobs, mushrooms, recipes, teriyaki marinade, tofu, vegan, vegetarian on August 13, 2013 by uberdish. Wraps and Sandwiches in the Raw! It occurred to me last weekend that if I plan on being successful on Natasha Kyssa’s detox program, I had better get organized and start making some lists. So, over a warm mug of Lemon Water, I poured over all my raw food books in search of some delicious and satisfying meals for the week. That job was pretty easy. The hardest part was narrowing my list down, as all the dishes looked absolutely mouth-watering. Along with 40 other adventurous gals, I am entering week 2 of the program. Unlike last week, week 2 meals must be 100 per cent raw and vegan. Sprouts and leafy greens are to be the focus of each or most of our meals. Since I like to try new things in the kitchen, I decided that I would make one or two dishes that I have never ever made. I have had great success with crepes in my dehydrator, so it only made sense to give wraps a try. As well, I recall last summer at the cottage when my sister-in-law had brought me a sample of one of her wraps. It was so vibrant and delicious stuffed with sprouts and a variety of vegetables. I decided I would make the same wrap. By Sunday afternoon, I had Judita Wignall‘s Garden of Eden Pesto Wraps in my dehydrator. On Monday, my husband and I sat down to wraps stuffed with a delicious pesto spread, broccoli sprouts, red pepper, red onion strips, sliced avocado, Julienne cucumber and shredded carrot. Basically, I stuffed them with what was available in my fridge. We ate our pesto wraps with a mixed green salad. This meal carried my husband and I through to dinner. In fact, I didn’t feel like much more than a smoothie later that same day. Still thinking of wraps, the next day we enjoyed sunflower herb pate in collard leaves. I stuffed the collards with the same veggies as the previous day’s wraps. On this day, I was craving something a little sweet which was odd. I have always been a person that could pass on sweets. In fear of breaking down and grabbing my daughters’ chocolate chip cookie stash, I catered to this craving by throwing some chopped dates in our mixed green salad. And just to be sure, I made a dressing of cold-pressed olive oil, apple cider vinegar and a good splash of maple syrup. Blend all ingredients in a food processor. Season to taste with salt. This was my delicious sandwich yesterday afternoon – a pesto spread, tomato and sprout sandwich! I had another for dinner and a piece this morning as my mid-morning snack. Place the zucchini, oil, salt and garlic in a food processor, and process into a puree. Add the chopped onion and dill and pulse processor a few times. Process the almond meal and flax meal into the batter. Spread the batter evenly on a lined dehydrator tray. Dehydrate at 104 degrees Fahrenheit for 6-8 hours. Flip directly onto a mesh tray and dehydrate for another 4-6 hours. This bread is moist and flexible. Today is leftover day. I have a busy night at the skating rink, so I will pack myself another wrap, an apple, and a jar of green smoothie. On busy days, I make more than enough smoothie to fill one or two jars as a snack later in the day. I feel great! I love that I don’t feel hungry throughout the day on this program. I also love the fact that I am now making foods I may never have tried if it wasn’t for this cleanse. I love that my family will share these foods with me. I will mention, as well, that I LOVE, LOVE, LOVE the fact that my fingernails appear stronger and longer (I’ve never had nice nails) and I can comfortably wear my blue jeans all day long! It only took 3 runs at it, but I finally learned that the key to being successful on this program is to be organized. Make lists and keep your fridge stocked with lots of fresh fruit and veggies. This entry was posted in A Raw Cleanse, Meals and tagged raw, recipes, vegan on April 11, 2013 by uberdish. Beet and Beet Green Risotto is by far one of my family’s favourite dishes. I make it a few times each year, mostly at Christmas because of its vibrant red and green colour. Recently, my 9 year-old daughter asked for it again when we spotted a beautiful bunch of organic beets in our grocery store. My sister-in-law first made me this dish nearly 14 years ago. After the first bite, I knew I had to have the recipe. The original recipe comes from epicurious. For years, I made it with butter (or garlic butter!) and a good helping of Parmesan cheese. I have recently discovered that these ingredients are not at all necessary to create a creamy and flavourful risotto. I now make my risotto with no oil and thanks to a recent post from liveblissful, I now use veggieful’s vegan parmesan cheese made from cashews, nutritional yeast and a bit of salt. Finely chop onion and trim stems close to top of beets. Cut beet greens into wide slices and chop stems. Peel beets and cut into a fine dice. In a small saucepan, bring vegan soup stock to a simmer and keep it a low simmer. In a heavy saucepan, cook onion and garlic until softened in about 3 tablespoons of water over medium heat. Add beets and stems and cook for about 5 minutes, stirring occasionally. Stir in rice and cook for about 1 minute. Stir in 1 cup of simmering broth, stirring constantly. Keep saucepan at a strong simmer until broth is absorbed. Continue cooking, adding 1/2 cup of broth at a time, stirring constantly. Be sure to allow each broth addition to be absorbed before adding the next. After about 10 minutes, stir in beet greens and continue cooking and adding broth 1/2 cup at a time. Once rice is tender and creamy-looking but still al dente, remove pan from heat and stir in vegan parmesan cheese. So, don’t throw out those greens and stems on top of your beets!! Like swiss chard and kale, these greens are our “superheroes”! If you have some greens leftover from your risotto, try them in your morning smoothie or tossed in your mixed green salad. This entry was posted in Meals and tagged beet greens, beets, gluten-free, recipes, risotto, vegan on March 7, 2013 by uberdish. Where we live, if you wake up to a beautiful, mid-winter, sunny day, you grab your coat and hat and head outside! We did just that on the weekend – for “a little vitamin D” as the saying goes. Sunshine can be rare these days, so we decided to celebrate this good weather with a little snowshoeing. We got lots of exercise and fresh air, but the question is did we get our vitamin D? You see, we live approximately 45 degrees north of the Equator. This time of year the sun’s rays are not that strong. However, when reflected off the snow, the sun’s ultra-violet rays double in strength. Vitamin D is all the talk these days. It is considered an important vitamin in the prevention of many acute illnesses and chronic diseases. As the media continuously reports, most of us Canadians are deficient in this vitamin. The best source of vitamin D is produced by our skin after sun exposure. There are some food sources such as, fortified grains, fortified plant-based and animal-based milk, fish, and cod liver oil. However, all these food sources have a minimal amount of vitamin D compared to what our bodies can make from the sun. A plant-based diet is not the cause of a vitamin D deficiency. A vitamin D deficiency is a sign of sunlight deficiency. According to Dr. Matt Lederman, a lecturer in the Plant-Based Nutrition Program at Cornell, vitamin D is made by our bodies when 50% to 75% of our skin is exposed to UVB light. That is, the sunlight we experience around noon hour. If you have the skin type which easily burns and rarely tans, like myself, then only 15 minutes in the sun is required. The darker your skin type, the longer your skin should be exposed to sunlight. Lederman also suggests that the day’s UV index must be 3 or higher for your body to make vitamin D. If you check out this chart from Environment Canada for today, only a few cities in Canada, and these cities were in southern Ontario, ever got to a UV index of 3. If getting vitamin D from the sun is unlikely due to your geographic location, your inability to get outside in the sunlight, or your concern with unprotected sun exposure, then supplementation may be required. When taking vitamin D supplements, be cautious as to avoid toxicity. I believe that supplements should be treated like medicine and taken under the care of a health care provider. If you are concerned about your vitamin D levels, get some blood work done. Vitamin D supplements are generally derived from sheep’s wool or fish oil. Vitashine does make an organic, non GMO plant-based vitamin D supplement made from lichens. After a good few hours in the snow, we went home to a big bowl of Sweet Potato Lentil Stew. It is hearty and absolutely perfect as a meal on a cold winter’s day. This entry was posted in Meals and tagged beans, gluten-free, recipes, red lentils, sweet potato, vegan on February 20, 2013 by uberdish. Actually, my love happened to be away with work. Somewhere very warm I may add. At home, the girls and I worked feverishly throughout the day keeping the snow from piling on our walkway and driveway. I think we shoveled snow at least 4 times yesterday before a very kind neighbour came along with his handy, dandy snow blower. But, we had chilli to keep us warm. It was a real treat to sit down to a bowl of Ally’s Chilli at the end of a hardworking afternoon! Ally’s chilli is the perfect blend of spices to keep you toasty. This recipe comes from one of my favourite bloggers. Ally is “an Aussie mamma” who writes passionately about vegan parenting and animal rights. Her blog’s name is Made of Stars and it is truly brilliant! I am thrilled that Ally shared her and her mom’s chilli recipe with me. This recipe is simple (a perfect dish for a busy weekday) and it is 100% kid-approved – my 2 girls gave it a 2 thumbs up in between heaping spoonfuls! Ally said that this chilli has become a staple in her house. It will now be a staple in our house, too! We ate a bowl of this alone for dinner. (Well, my 9-year-old daughter actually ate 2 big bowls!) There was no need for anything else at our dinner table. Saute the onion in some water. ( That’s right! This works just fine! No need to saute in oil and add extra fat to our diets!). When onions have softened, add garlic and chopped zucchini. Continue to saute for about 3 minutes then add the spices. Add the can of tomatoes and salt and pepper. If you prefer, you can use an immersion blender and blend the tomatoes for a smoother consistency. You can see from my photo that we like chunky tomatoes in our chilli so we did not puree them. Add the beans. Bring the pot up to boiling, then add quinoa, if you so desire. Cover and reduce heat to a low simmer for about 10 minutes. *When it was time to make this dish, I turned to my well stocked pantry. Yesterday, was not the day to sit around and wait for beans to soften in a pot. So, I used Eden Foods no salt added kidney beans and Eden Foods no salt added black beans. Eden Foods do not line their cans with BPA. They are actually the only canned bean that is BPA free. I also used VitaBio Organic diced tomatoes (also contains no BPA or GMOs). Having these foods in my pantry, makes following a healthy diet easier. 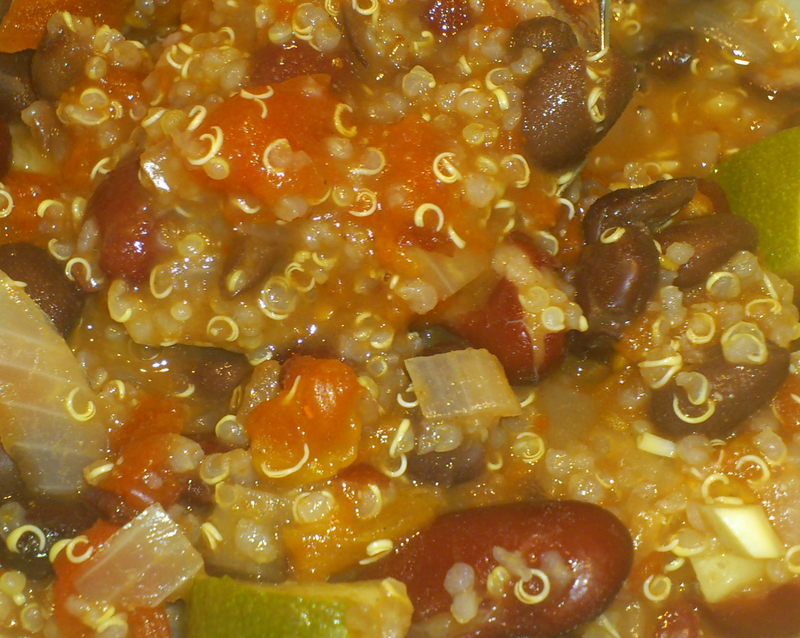 This entry was posted in Meals and tagged beans, nutritious food, quinoa, vegan chilli on January 29, 2013 by uberdish.